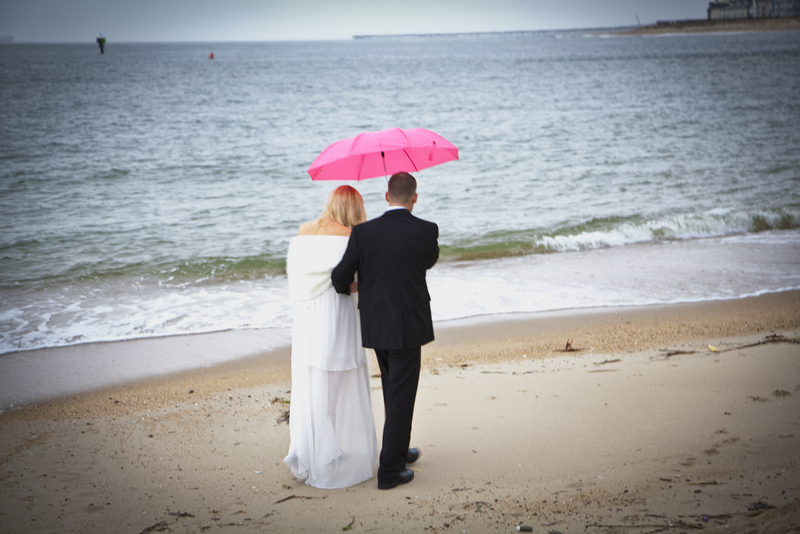 Beach Weddings Virginia / Elopement / What if it rains? Yes, it is possible that it will rain on your wedding day. We often hear a bride say “I will just think positive and it won’t rain” Positive thinking is indeed a good thing. And a good dose of positive thinking will be helpful to you in many situations. But weather is one of those situations not influenced by positive thinking. So, we recommend that if you have any guests coming to your wedding, have a confirmed backup rain location arranged. If it turns out to be bright and sunny (like it usually is in Virginia Beach) on your wedding day, you might still want to have some of your photography done in the alternate indoor site just for variety. A backup rain location will cost you something and you may not end up using it. But don’t despair. Think of it as “insurance”. With insurance, you pay for it but hope you don’t have to use it. That’s just my advice…based on two decades of experience with outdoor weddings. However, a wedding with no guests (such as our Sunset Wedding for Two) a backup rain location is not so critical. That’s because with a 2-person wedding, you can be more flexible with the date and time. For instance, if rain is predicted for your Saturday evening wedding, you may be able to switch it to Friday evening or Sunday morning. The logistics are so much easier with a 2-person wedding. Again, that’s just my advice.